Here's the problem with Preterism. Revelation 16:12 states that at the time of Armageddon, the Great River Euphrates will be dried up to make way for the Kings of the East to come down against Israel for the Battle of Armageddon (verse 16). Preterists say that the destruction of Jerusalem in 70 AD was this Battle of Armageddon. Big problem: the Euphrates did not dry up. In 70 A.D. the troops who were to destroy Jerusalem at Armageddon, were to be kings of the East. However, the Romans destroyed Jerusalem in 70 A.D. from the West not from the East. Where do they come up with their arguments? This doctrine was founded by the Jesuits back in the time of the Reformation. The The Reformers were preaching from Revelation 17 that Mystery Babylon was Rome. So the church was hemorrhaging bad. The Protestants were breaking off like crazy so the Jesuits had to stop this and explain that this was not Rome so they made up this doctrine of Preterism. So that's what the doctrine of Preterism came from. 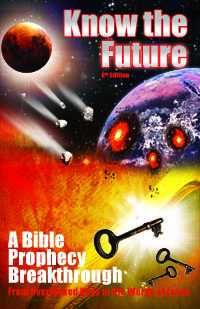 Today some have unwittingly bought into it because of a lack of breadth in their knowledge of biblical prophecy. (Mentioning that Jesuits invented it is not part of the argument for why it's false, just a detail. They originated Futurism too). Another point on this is that the Book of Revelation was not even written until about 95 or 96 AD. All of our best sources say that this is true. Iraneus was a disciple of Polycarp who was a disciple of John who wrote Revelation. Iraneus said that Polycarp told him that the book was written in the days go and of Dometian who left office around 95 or 96 AD and that's when all the exiles that were under religious persecution by Dometian were released. That's when John the Revelator was released. He then returned to deliver his messages to the seven churches of Asia. The core of the belief of Preterism is Daniel 9:27 where it says that he shall confirm the covenant for seven years. This involves the teaching of Daniel's 70 weeks, one of the most important prophecies in the Bible. See about the Confirmation of the Covenant to understand this properly.